The family of Mr. and Mrs. Hazen Adams will honor their parents with an open house at the North Davis Bank’s Community room, 320 E. Gentile, Layton, on Sunday, Mar. 3, between the hours of 3-6 p.m. THE OPEN house is being held in honor of the couple’s golden wedding anniversary. Mr. and Mrs. Adams were married in the Salt Lake LDS Temple Mar. 6, 1918. Mr. Adams was born Nov. 14, 1893, a son of Andy and Harriet E. Adams in Layton. Mr. Adams attended school in Davis County in the one-room school house in Dawson Hollow. When he was graduated from grade school he attended college in Logan, now USU. HE ALSO RAN the steam thrasher for David O. Green for 20 years. At the age of 13 he began playing the fiddle in the Adams’ Orchestra with his father and sisters, Zilla and Vida, and cousin Dan Adams. This orchestra was known all over Davis County. Mr. Adams drove the school bus for the Davis County School Board for 15 years. He has also been a farmer all his life. MRS. ADAMS, formerly Sylvia Flint, was born Oct. 1, 1898 to Fred and Eliza Flint in West Point, Utah. She has been a Relief Society visiting teacher for 42 years, a Primary teacher for 12 years and a Sunday School teacher for a number of years. She cooked school lunches for the Davis County School Board at North Davis Junior High and Layton Elementary for many years until she retired. 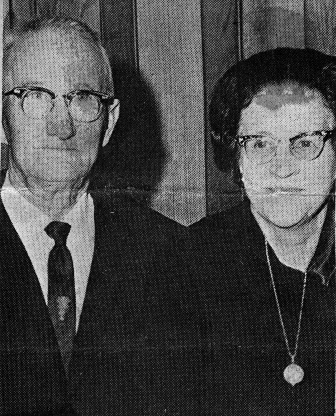 MR. AND MRS. Adams are the parents of the following sons and daughters: Mrs. Alden (Nora) Burton, Fruit Heights; Mrs. David (Rhea) Sedgwick, Folsom, Calif.; Mrs. Eugene (Faye) Parker, Ogden; Lynn H. Adams and Kenneth H. Adams, both of East Layton. The couple has 18 grandchildren and four great-grandchildren. It is requested by the couple that gifts be omitted.